Attracts hoverflies which eat aphids. Sow outside in March or June-September in a frost-free greenhouse. Hordeum Vulgaare Variegata. A variety of barley that provides vitamins and fibre for a cat. quick growing perennial reaches 6" (15cm) in just six weeks. Sow in batches for a constant supply. Reaches 2ft (60cm) if not eaten sooner!! Replaces Dainty Marietta. Helps repel soil nematodes and whitefly from tomatoes. Sow early spring. Single, yellow with maroon blotch. 30cm. Helps repel soil nematodes and whitefly from tomatoes. 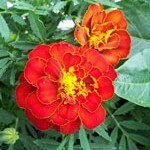 Sow early spring.Semi-double red flowers with yellow centre. Helps protect potatoes from eelworm. Also used for weed-killing properties - ground elder, bindweed and couch grass. However it grows enormous and can easily reach 8 ft. Flowers are late and insignificant. Sow early spring to plant out late April. It can be difficult to germinate. Attracts aphid eating insects so plant amongst vegetables. Orange flowers add colour.